In the course of setting up the Flying Dutchman business, I have been able to visit two different factories that make scroll saw blades. Except for some proprietary engineering process, both companies use the same methods for producing blades. A big roll of wire-about 4 or 5 feet in diameter- is set up in front of a press. This press makes the wire flat. The press also sets the desired thickness of the blade they want to produce in a particular run. There is a small table right behind the press where the teeth are milled. The now flattened steel wire is moved forward 5 inches at a time and a cylinder moves into the steel to cut the teeth for each blade. This cylinder is about 4 inches in diameter and has very sharp edges which cut the teeth of the new saw blade. A different cylinder is needed for each type/size of blade that can be produced. As the cylinder moves back out of the way, the steel wire moves forward again 5 inches so the next blade can be milled. The process of using this "cylinder" is why this is called being milling. 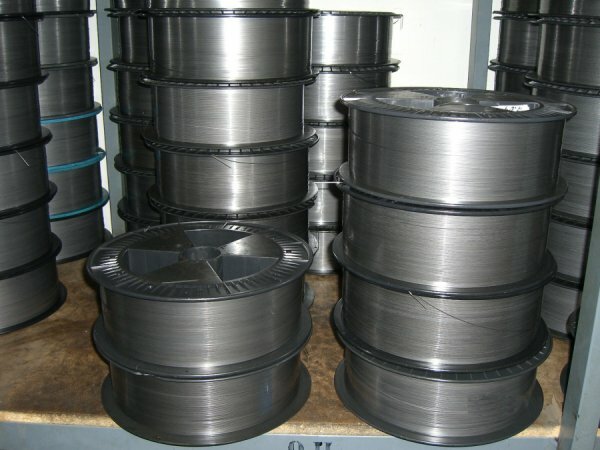 When the wire leaves this table it is rolled up again on a big spool. 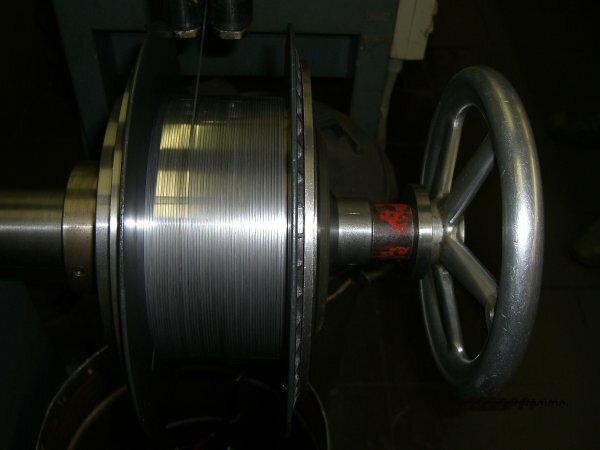 Then this spool is moved to a different location in the plant where the steel is hardened. The steel is hardened by heating the wire and then moving the wire through a bath of oil that is kept at the proper temperature for getting the perfect hardness of the blade. A computer controls the temperature of the oil so there is no variation and the proper hardening can take place at all times. The next machine cuts the roll of hardened steel into 5" pieces. The blades have now been produced and now need to be checked for quality and packaged. The blades are hand counted by workers. The majority of these workers are ladies. The companies have found that most women have a much better feel in their fingers than most men do. Test this for yourself-take a dozen or more blades in your right hand, move them with your thumb and index finger around a little and then count a dozen blades by 3's. You will need to use your thumb and index finger to help with the counting: 3, 6, 9, and 12. See how well you could do this job. They sit at a big round table that has tubes about 2 inches from the outside edge. The workers grab a quantity of blades and then count out a dozen to place in the appropriate tube. The table turns slowly-in about 3 inch intervals giving them enough time to fill the tubes as it moves to the next part of the operation. Above this table is a machine with an arm above the table that will move down and pick up a grouping of 12 blades. This machine then spins the group of 12 blades while very thin wire is wrapped around the grouping of blades. This package is then dropped into a container. Workers then count and gather 12 of these packages together. The next machine places this combination of 12 packets of 12 blades each into poly bags. These bags are labeled with the name of the company and the size and measurements of the particular blade that was made in this run. I'm sure that when you have used a scroll saw for many years you have found that sometimes you have received blades that were not good. I have been told that this is a problem with the wire the blades are made from. There can be some bad spots in the roll of wire that was missed in quality control checking by the company that first made the wire. Also you will find that with some blades you have to move the wood to the left more than other times. When the cylinder is getting dull, it will leave just a little bit bigger burr than when it is new. It wants to cut more to the right. Therefore you have to move your work piece a little more to the left, in order to stay on your line. If there are any questions feel free to email us and we will try to answer.